Thanksgiving is always one of the busiest travel times of the year -- and no surprise, as we race home to gobble up three servings of legendary homemade punkin' pie. Next week, I'll be part of the holiday rush heading to see the family (and enjoy my brother's take on our grandma's classic). While I prefer to be home, I know not everyone will be stuffing their face with turkey and, well, stuffing. If your Thanksgiving plans aren't around a table, a new Switchfly survey shows you're not alone: lots of Americans will forgo traditional festivities to take short jaunts out of the country. So, where are they heading? Mostly places warm and exotic, of course. On average, international travelers will spend between four to six days soaking up the sun and sand abroad before heading home. Here are the top eight places Americans are escaping to for the holiday. And if you're not heading south for the season, consider spicing up your family's traditional smorgasbord with a few new international flavors suggested below. Pinot Noir: Argentine Pinots tend to be fuller than their American counterparts. The 2014 Schroeder Estate vintage, out of Patagonia, will pair well with a Thanksgiving meal -- and it won't break the bank, retailing around $20 a bottle. Red Stripe Lager: For your beer-loving guests, Jamaica's national beer is light enough to leave room for turkey seconds (or thirds, or fourths). 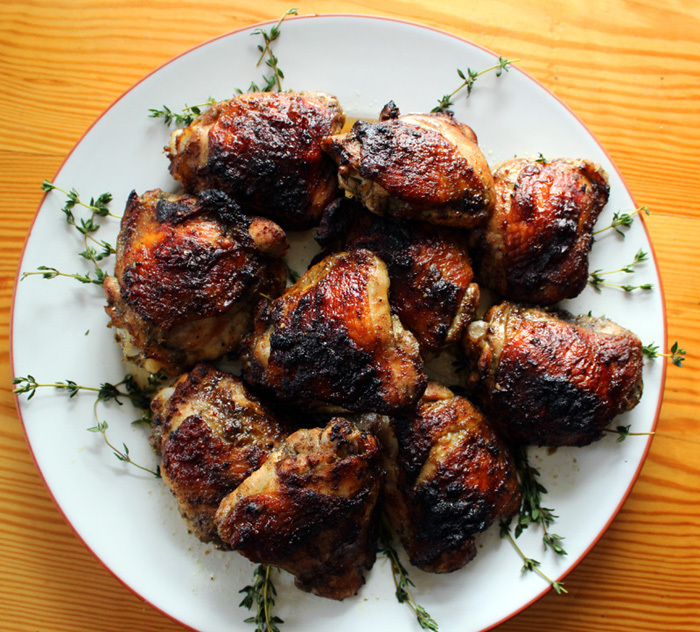 Jamaican Jerk Chicken: There's a reason jerk stands pop up on virtually every Jamaican beach. Your Thanksgiving guests won't be disappointed with this as an alternative to traditional turkey. Pão de Queijo: If there's anything Americans love, it's cheese and bread -- so these simple, savory cheesy Brazilian rolls will go over well. Wasakaka Sauce: To spice up your main course, wasakaka is a popular Dominican topper made from citrus, parsley, garlic, and chili peppers. It pairs best with chicken. Gandules: Known commonly as pigeon peas, this easy side dish appears at Caribbean holiday meals in places like the Bahamas and Puerto Rico. For a delicious appetizer, whip up this Escabeche Pigeon Pea Crostini recipe. Brigadeiros: These chocolate truffles are a celebratory staple in Brazil -- and they're as pretty as they are delicious. Pumpkin Flan: This recipe by Wendy Polisi puts a Thanksgiving spin on the traditional Mexican dessert. Cafe de Oila: Mexico's signature cinnamon-infused treat is a perfect caffeine fix after a big meal.